Beautiful mid-summer blooms | Image via Love N' Fresh FlowersIf you enjoyed the how-to feature on creating your own bridal bouquet in our August wedding issue, here’s even more petal and stem happenings from Jennie Love of Love N’ Fresh Flowers. This past weekend Love N’ Fresh hosted a floral design workshop for brides to be on creating one-of-a-kind arrangements using locally-grown blooms. 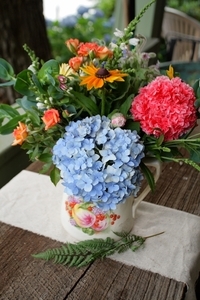 If you missed out, never fear, this weekend Love invites budding florists and flower enthusiasts to join her for “Bloom Bounty,” a mid-day workshop at the Wyck Historic House and Garden that celebrates the abundance of vibrant local blooms available in mid-summer. Zinnias, hydrangeas, celosica, veronica, flowering herbs, sunflowers, snapdragons, and more are blossoming throughout the area, bringing sweet smells and pops of color along with them. The workshop will allow participants to utilize this seasonal bounty to create at least two designs to take home. Love will also cover support materials in vases that are more sustainable than floral foam, offer instructional-handouts, and serve light seasonal refreshments. Don’t miss out! Sign up here, and fast! Class size is limited to 10.